Carbon fiber (carbon fibre), alternatively graphite fiber, carbon graphite or CF, is a substance consisting of extremely thin fibers about 0.005-0.010 mm in diameter and made primarily of carbon atoms. The carbon atoms are bonded together in microscopic crystals that are pretty much aligned parallel to the long axis of the fiber. The crystal alignment makes the fiber very strong for its size. Several thousand carbon fibers are twisted together to form a yarn, which may be used solely or woven into a fabric. Carbon fiber has numerous different weave patterns and can be added with a thermoplasticresin and wound or molded to create composite materials such as CFRP to give a high strength-to-weight ratio material. The density of carbon fiber is also quite a bit lower than the density of steel, making it perfect for applications requiring low weight. The properties of carbon fiber such as low weight, high tensile strength, and low thermal expansion make it very popular in aerospace, military, civil engineering, and motorsports, along with other competition sports. Unfortunately, it is somewhat expensive when compared to similar materials such as plastic and fiberglass. Carbon fiber is very strong when in tension or bent, but not impressive when compressed or exposed to high shock (e.g. a carbon fiber bar is very troublesome to bend, but will crack easily if hit with a hammer). In 1958, Roger Bacon invented high-performance carbon fibers at the Union Carbide Parma Technical Center, positioned outside of Cleveland, Ohio. Those fibers were manufactured by heating strands of rayon until they carbonized. This process proved to be inefficient, as the resulting fibers had only about twenty percentcarbon and had stiffness and low strength properties. In the early 1960s, a process was invented by Dr. Akio Shindo at Agency of Industrial Science and Technology of Japan, using polyacrylonitrile (PAN) as a raw material. This produced a carbon fiber that contained about fifty five percent carbon. The high potential strength of carbon fiber was observed in 1963 in a process developed at the Royal Aircraft Establishment at Farnborough, Hampshire. The method was patented by the UK Ministry of Defense and licensed to 3 British companies: Rolls-Royce, already creating carbon fiber, Morganite & Courtaulds. They were able to create industrial carbon fiber production facilities within a few years, and Rolls-Royce took advantage of the new material's properties to make a place in the American market with its RB-211 aero-engine. Even then, though, there were isssues over the ability of British industries to make the best of this breakthrough. In 1969 a House of Commons select committee inquiry into carbon fiber, asked: "How then is the nation to reap the maximum benefit without it becoming yet another British invention to be exploited more successfully overseas?" Ultimately, this concern was justified. One after another the licensees pulled out of carbon fiber production. Rolls-Royce's interest was in the most current aerospace applications. Its own production program was to let it to be leader in the use of carbon fiber reinforced plastics. In-house manufacture would likely stop once reliable commercial sources became available. Sadly, Rolls-Royce pushed the the most current technology too aggressively, in using carbon fiber in the engine's compressor blades, which proved vulnerable to damage from bird impact. What seemed a great British technological triumph in 1968 quickly became a disaster as Rolls-Royce's ambitious schedule for the RB-211 was endangered. Rolls-Royce's problems became so great that the company was eventually nationalized by Edward Heath's Conservative government in 1971 and the carbon fiber production plant sold to form Bristol Composites. Given the limited market for a very pricey product of variable quality, Morganite also decided that carbon fiber manufacturing was peripheral to its core business, leaving Courtaulds as the only big UK manufacturer. The company continued making carbon fiber, developing two main markets: aerospace and sports equipment. The speed of production and the quality of the product were improved. During the 70s, experimental work to find alternative raw materials led to the introduction of carbon fibers made from a petroleum pitch derived from oil processing. These fibers contained about 85% carbon and had excellent flexural strength. During the 1980s Courtaulds continued to be a major supplier of carbon fiber for the sporting goods markets, with Mitsubishi its main customer. Sadly, a move to expand, including building a manufacturing plant in California, turned out badly. The investment didn't generate the anticipated returns, leading to a decision to pull out of the area. Courtaulds ceased carbon fiber manufacturing in 1991, though ironically the one surviving UK carbon-fiber manufacturer continued to thrive making fiber based on Courtaulds's precursor. Inverness-based RK Carbon Fibres Ltd has concentrated on creating carbon fiber for industrial applications, and thus does not need to compete at the quality levels reached by overseas manufacturers. Each carbon filament thread is a bundle of many thousand carbon filaments. One filament is a thin tube with a diameter of 5-8 micrometers and consists almost exclusively of carbon. The earliest generation of carbon fibers (i.e., T300, and AS4) had diameters of 7-8 micrometers. Later fibers (i.e., IM6) have diameters that are approximately 5 micrometers. Precursors for carbon fibers are rayon, polyacrylonitrile (PAN) and pitch. Carbon fiber filament yarns are used in several manufacturing techniques: the direct uses are for prepregging, pultrusion, filament winding, weaving, braiding, etc. 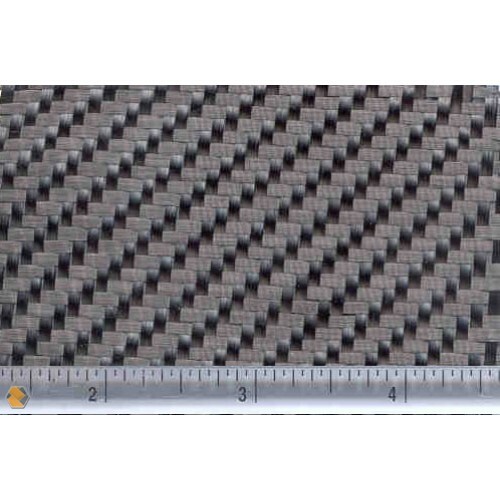 Carbon fiber yarn is rated by the linear density (weight per unit length, i.e. 1 g/1000 m = 1 tex) or by number of filaments per yarn count, in thousands. For example, 200 tex for 3,000 filaments of carbon fiber is three times as strong as 1,000 carbon fibers, but is also three times as heavy. This count is usually expressed as 3K, 12K, 6K, etc. This thread can then be used to weave a carbon fiber filament fabric or cloth. The appearance of this fabric generally depends on the linear density of the yarn and the weave chosen. 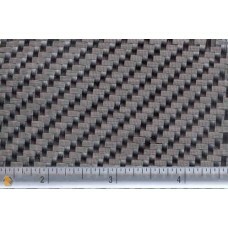 Some commonly used types of weave are plain, 2x2 twill, 4x4 twill and satin. A common method of manufacture involves heating the spun PAN filaments to approximately 300 °C in air, which breaks many of the hydrogen bonds and oxidizes the material. The oxidized PAN is then put into an oven having an inert atmosphere of a gas such as argon, and heated to approximately 2000 °C, which induces graphitization of the product, altering the molecular bond structure. When heated in the correct conditions, these chains bond side-to-side (ladder polymers), forming narrow graphene sheets which finally merge to form a single, columnar filament. The result is usually 93-95% carbon. Low quality carbon fiber can be created using pitch or rayon as the precursor instead of PAN. The carbon can become further enhanced, as high modulus, or high strength carbon, by heat treatment processes. Carbon heated in the range of 1500-2000 °C (carbonization) exhibits the highest tensile strength (820,000 psi, 5,650 MPa or N/mm²), while carbon fiber heated from 2500 to 3000 °C (graphitizing) exhibits a higher modulus of elasticity (77,000,000 psi or 531 GPa or 531 kN/mm²).